Designed to accommodate the growing use of portable technology in the workplace, including laptop computers, tablets, e-readers, cell phones, MP3 players and more, Humanscale's Tech Tray offers a simple solution for technology access and storage. 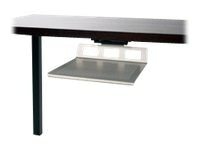 Sized to easily hold a laptop with docking station, the Tech Tray helps organize and optimize a workspace by getting technology off the desk. Even better, it keeps technology out of sight, out of the way, and safe from the spilled cup of coffee.